The problem: Every web page should have a title that describes the page accurately and concisely, but it's not immediately obvious how to set it in Contribute for existing pages on your website. Open the web page in Contribute and click "Edit Page." Be as obvious and straightforward as possible. Use language that closely matches the title that shows up in the body of the web page. Include the most important keywords near the beginning. It is ok to include the name of your library/organization at the end. Specifying "Home" or "Homepage" in the homepage's title is optional. The problem: Contribute makes it easy to add images, but it doesn't prompt you to finish the job by adding alternate text for them. What's alternate text? : Alternate text is a snippet of text that takes the place of an image on a website when the image cannot be displayed. 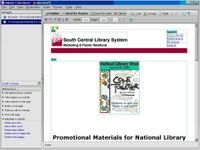 Some situations where alternate text would appear instead of the image: a bad image URL causing "Image not found" errors, anyone using a browser with images turned off to make pages load faster over a dial-up Internet connection, or a visually-impaired person using a screen reader to access a web page. Why it matters: Best practice is to add alternate text to images that carry meaning as a safeguard for any of the situations mentioned above. It's part of the Web Content Accessibility Guidelines and the Section 508 Standards -- and if that's not enough encouragement, it's also common courtesy (it's a little rude to make people guess what an image means when they can't see it). Click "OK" and continue editing the page as needed. Be concise and shoot for 50 characters or less. Technically there is no length limit, but some browsers may cut off very long alternate text if image-loading is turned off or if they cannot locate the image. 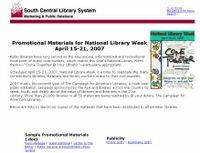 Good examples: "Patrons enjoying the library," "Beach Reads on display in the library," etc. Read more about inline image editing at the Adobe Contribute Developer Center. Contribute tip: "You cannot perform this action in this region of the page"
Most likely, this has to do with templates, which you can't edit in Contribute. The solution: place the cursor in an area you can type in (say, the middle of the last word in a line) and right-arrow over to the end of the line - but not beyond - and start typing. You can also clear errors like this by saving & closing your draft, then reopening it. Thanks to Meg and Cheryl for this tip! Since many SCLS libraries have started using Macromedia Contribute to edit their own web pages, I thought I'd toss in an occasional tip or trick for using it. Here's an indispensable one - to preview the changes you've made to a page before you publish it, just press the F12 key. So handy, you'll not know how you lived without it!